So much going on in York, so many planning applications etc, but this week let’s escape into some gentle nostalgia, and head back to a time when Sutler’s bar was Army and Navy Stores and groups of football fans were ‘Specially Catered For’ in the local cafes. 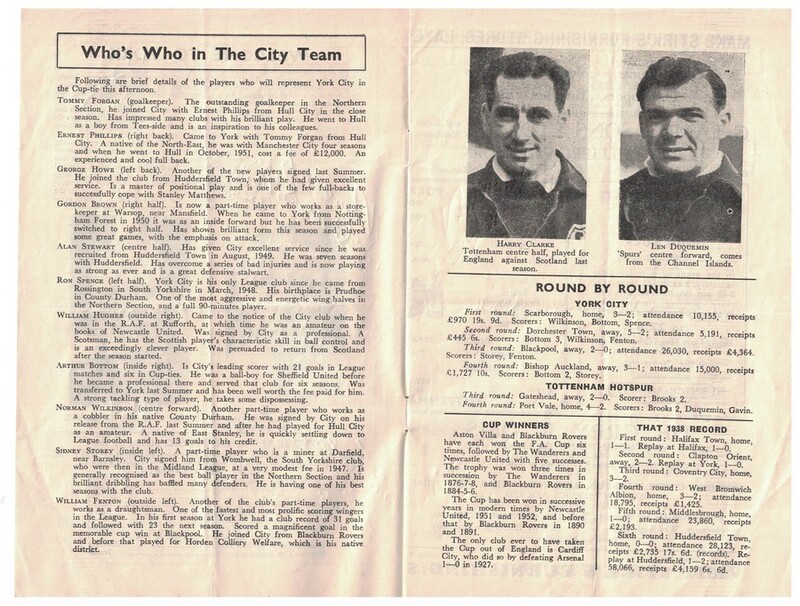 Before it’s returned to its owner, I have permission to share with you these scans of a 1955 football programme. Which, as you can see, is signed by the players. 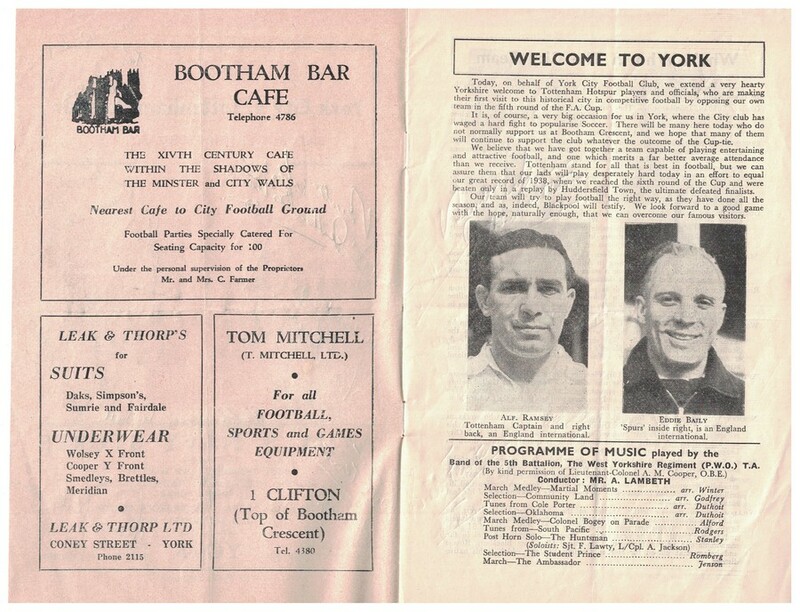 It’s one of a pair of programmes from that year, from matches taking place in February and March 1955, a famous cup-run for York City Football Club. We’ve mentioned it before, when looking at a photo of the Gasworks Gang. 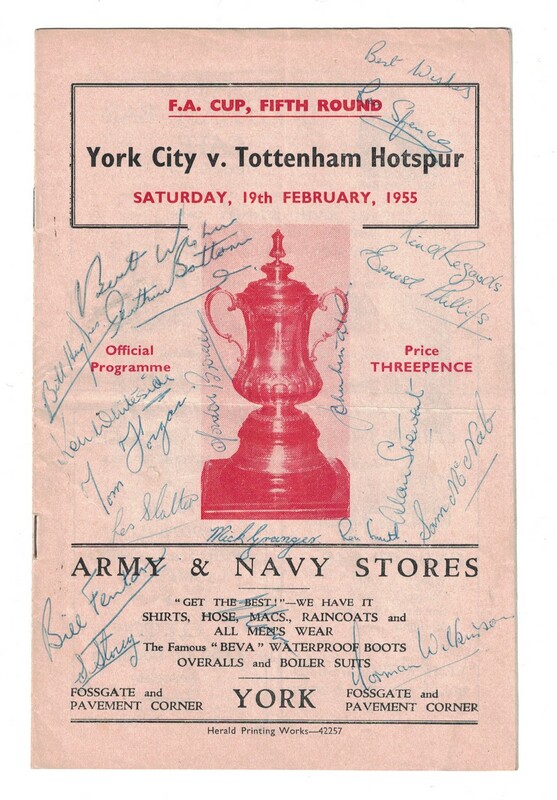 As well as a couple of names I recognised in the signatures on the front of the programme (Norman Wilkinson and Arthur Bottom) the other obvious thing is the ad for Army and Navy Stores. It sold ‘Beva’ boots, apparently famous and presumably different from ‘bovver’ boots. The programme was printed at the Herald Printing Works. The nearest cafe to the football ground, with ‘Football Parties Specially Catered For’, it says. Also, I was surprised to see that there was a shop selling sports equipment at the top of Bootham Crescent. Anyone remember that? 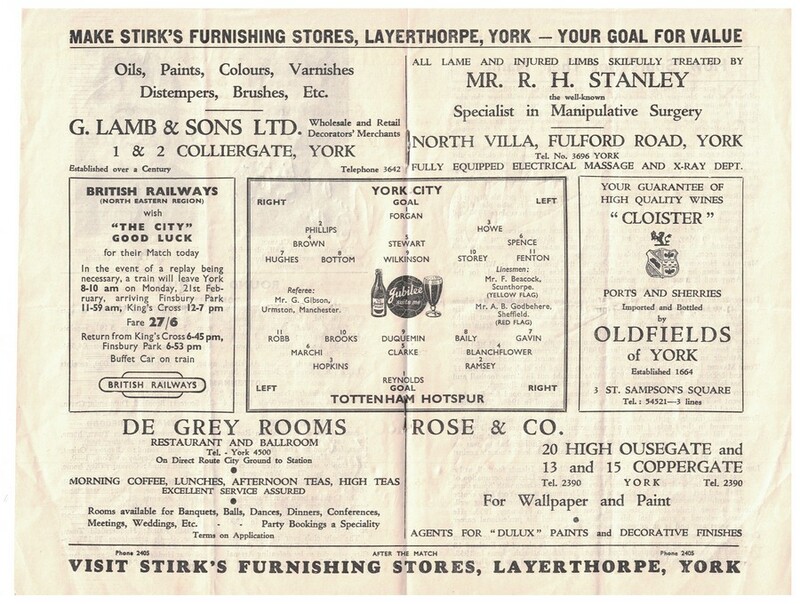 There’s also an ad for that well-known York department store Leak and Thorp’s, selling not only the Wolsey X Front but the Cooper Y Front. Different times, weren’t they. 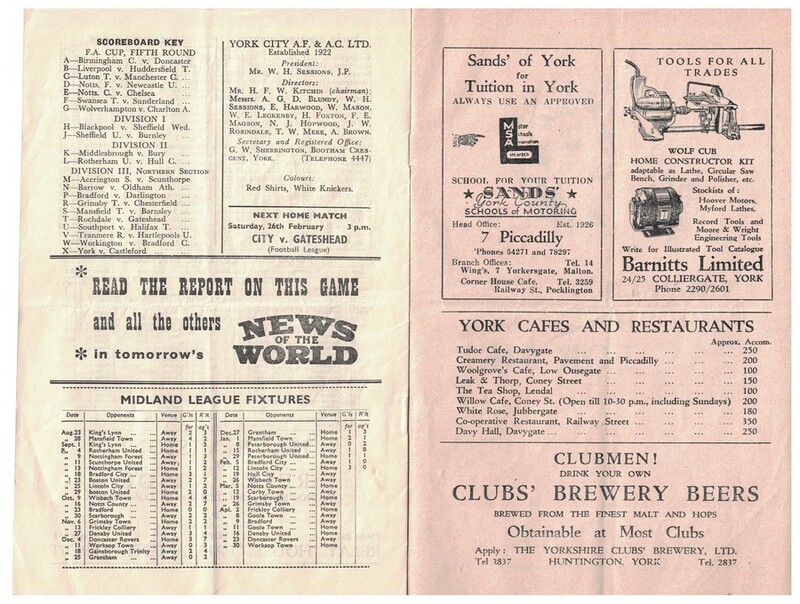 Norman Wilkinson, it tells us, is a ‘part-time player who works as a cobbler in his native County Durham’. Sidney Storey, another part-time player, is a miner at Darfield, near Barnsley. And alongside one of many adverts for booze a helpful list of York’s cafes and restaurants, in the days when there were far fewer of them. 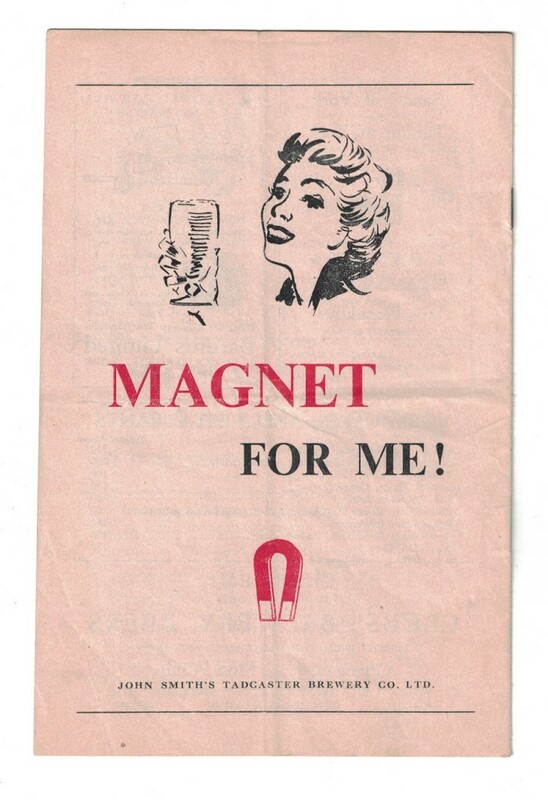 On the back cover, a lady enjoys her Magnet Ale — apparently a half pint, in a ladylike glass. If you’d like to be kept informed of new additions to this site please join the mailing list.